*Not to be confused with krumping, which is entirely different and not in any way the same. A crisp or crumble is a baked dessert in which the fruit filling is covered with a crunchy or, as the name implies, crumbly topping. 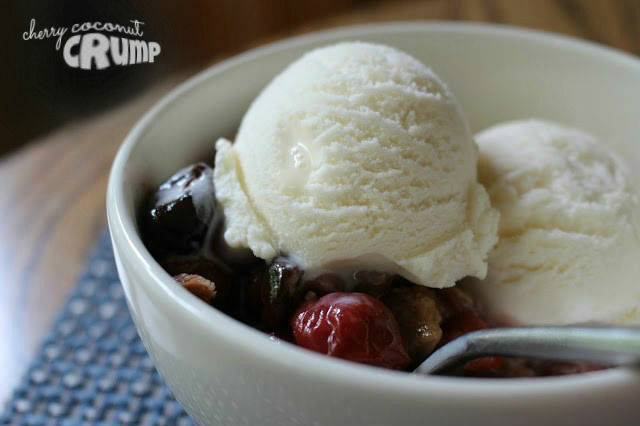 A slump or grunt is similar to a cobbler (which has a biscuit-like topping) except that it's cooked on the stovetop. Since I'm combining the two ideas and cooking my dish on top of the stove but using a crunchy topping, I decided to have fun with the name (as you know I like to do) and call it a Crump. Grumble would also work and is just as silly and amusing. While I'm at it, Gobbler kind of fits and makes me laugh too. I love portmanteaus. I also love fruit desserts, which is the point of this post. You can take pretty much any fruit and cover it with any combination of fat, flour, oats, sugar, and spices, and I'm enamored, especially if vanilla ice cream is involved**. Blueberry crisp, apple pandowdy, peach cobbler, strawberry-rhubarb pie--the combinations of fruit options and types of topping are absolutely endless. **True story: I've become such a food snob that I often refuse to eat certain desserts if they're not being served with ice cream. Oops. My latest creation was pretty standard. Fat, tart, juicy cherries were staring at me from the freezer (and taking up precious real estate! ), so they combined with some dried cherries and formed my filling. I cooked them down on the stovetop a little bit first to get the juices flowing. For the topping, I used a combination of butter and coconut oil for the fat, and enhanced that coconut flavor with some shredded coconut in the dry mix. Cooking the topping in the skillet before using it to make the filling means that this is very nearly a one-dish dessert, and that's always good if you're the one washing the dishes! Full disclosure: This dessert was...soupy. The original recipe called for just one tablespoon of cornstarch, but I added an extra tablespoon to the recipe below, as that would certainly help (though I haven't tested it yet). I also used a little over two pounds of cherries, but I'm not necessarily sure that was the problem. Regardless, it tastes great and I hope you give it a go, if only to tell people you made a cherry crump! To make the topping, finely chop 1/4 cup almonds. Combine flour, brown sugar, granulated sugar, vanilla, cinnamon, salt, and chopped almonds in bowl. Stir in melted butter and coconut oil until mixture resembles wet sand and no dry flour remains. Toast remaining 1/2 cup almonds, oats, and coconut in 10-inch nonstick skillet over medium-low heat until just beginning to brown, about 4 minutes. Add flour mixture and cook, stirring constantly, until lightly browned, 6 to 8 minutes; transfer to plate to cool. Wipe out skillet. For the filling, combine 2 tablespoons sugar and cornstarch in small bowl; set aside. Combine cherries, lemon juice, vanilla, salt, and remaining sugar in now-empty skillet. Cover and cook over medium heat until cherries thaw and release their juice, about 7 minutes, stirring halfway through cooking. Uncover, stir in dried cherries, and simmer until cherries are very tender, about 3 minutes. Stir in cornstarch mixture and simmer, stirring constantly, until thickened, 1 to 3 minutes. Remove skillet from heat and distribute topping evenly over filling. Return skillet to medium-low heat and cook until filling is bubbling around edges, about 3 minutes. Remove from heat. At this point, you can run the whole thing under the broiler (if your pan allows!) to ensure proper crispness of the topping, or let cool for at least 30 minutes before serving. Sadly, this is a dessert that deteriorates quickly, so finish it just as soon as you can! I love the name and the dish! Perfect summer time treat topped with ice cream! Interesting, I've never heard that word. This recipe sounds great. And you could totally substitute whatever fruit is in season! Grumble sounds great to me. This is a perfect summer dessert. Love the grumble. Kind of covers everything and yes....ice cream is a must. Love ALL the names (and the dessert)! OMG! I love it! Grumble sounds awesome! Interesting! I've never heard of slump or grunt before. Regional or I have just missed out? Either way, I will be trying this. HAHAHA I love your first sentence. I've never heard of a slump or grunt before - I love nerdy food facts like this. And the photos look great - I want some now. Thanks Grace! !